Eschscholzia californica, or California poppy, is one of the most commonly recognized California native plants, and arguably one of the most beautiful. Ferny, bluish- to silvery-green leaves mound into a 1’ to 2’ high plant that blooms extensively March through May with showy 1” to 3” diameter flowers. Petals of the brightest orange seem to have a satiny shine when viewed up close, and the flower heads sway elegantly in the breeze. Plant them in the entranceway to your house to have a cheerful and bright greeting in spring and summer. The flowering period may be extended with supplemental water as the season heats up. 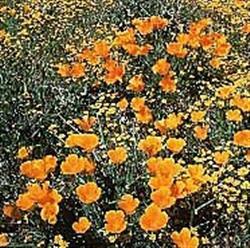 California poppy behaves as an annual, but readily reseeds for next year. California poppy requires fast draining soil and a sunny location, and can even be grown in containers. Birds, butterflies, and bees will all visit these striking flowers, making California poppy an excellent wildlife attractor.